From VEGGIE QUEST: Recipes, research, and tips to make eating a whole food, plant based diet easy and fun! In a small microwaveable bowl, mix together 1 Tbsp ground flax seed and 3 Tbsp water. Microwave for 30-45 seconds, or until gooey when stirred. Set aside. 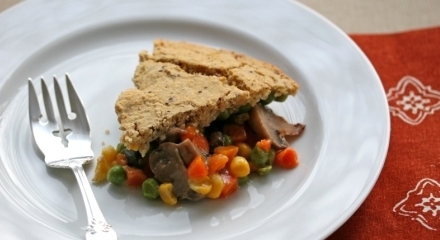 Place the frozen vegetables and mushrooms (fresh or frozen) in a microwaveable, deep-dish pie pan. Add ¼ c water, invert a dinner plate over the top, and microwave on high for 10 minutes, stirring after 5 minutes. Reserve the cooking liquid. 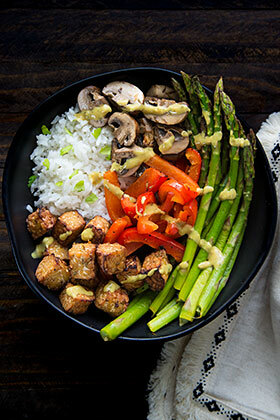 Prepare dry ingredients: In a large bowl, whisk together the corn meal, brown rice flour, amaranth flour, baking powder, salt, and powdered stevia (if using). Prepare wet ingredients: In a separate small bowl, add the apple sauce, ½ c nondairy milk, liquid stevia (if using) and flax seed goo. Mix well with a fork. Once veggies are done cooking, carefully drain the cooking liquid into a measuring cup. Add nondairy milk to the cooking liquid until you have 1 c liquid total. Pour into a small pot. Add nutritional yeast, onion powder, garlic powder, salt, and black pepper to the pot, and whisk to combine. Measure 2 Tbsp of cornstarch and 2 Tbsp cold water into the measuring cup and mix thoroughly with a fork. Whisking constantly, add the cornstarch slurry to the boiling liquid. The liquid should thicken immediately; remove from heat after 5-10 seconds. Add thickened sauce to vegetables in pie dish and stir gently to combine. Pour batter over top of vegetables in pie dish and smooth to the edges with a spatula. Bake at 400F for 30-35 minutes, or until a toothpick inserted in the cornbread comes out clean. If using powdered stevia, add to the dry ingredients. If using liquid stevia, add to the wet ingredients. Sauce may bubble up around the edges as the pot pie bakes; it will still taste fantastic! Visit Veggie Quest for nutrition information. Yumm! I appreciate the recipe being low-fat and gluten-free. This one is delicious! Hi Halina, I haven’t tried it but, you should be able to substitute 1/2 cup whole wheat pastry flour for the brown rice and amaranth flour. Let me know how it turns out–I’d love to add a note in the recipe on my blog! 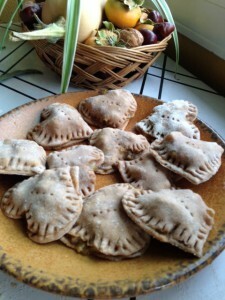 Can I use whole wheat pastry flour instead of the gluten free. It sounds delicious but we are in need of low fat not gluten free. Hi Tina, so glad you liked it! I went through six rounds of testing with this one, so I’m glad it paid off. 😉 Will have to try it with extra green beans next time!